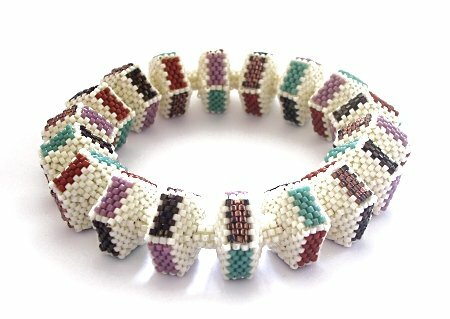 This slip on bracelet is part of my Geometric Beadwork Series and was the first one I made in this style and it's become a style I have now often repeated. Made up of 18 beaded pentagons, it is beaded as a continuous rope with the ends joined to make a bangle. I used 6 different colours, 5 for the faces of the pentagons and 1 as a base. I mixed the face colours as I went along, placing them so that when you look at any face no colour sits next to itself. Pentagons are the most complicated of the shapes to bead and need quite a different thread path from the others, which took some time to figure out satisfactorily. Instructions for this item are available here. I like this style so much I beaded another one on the same basis. I wanted to see how different it looked with the colours not mixed, but simply one colour appearing on each face.